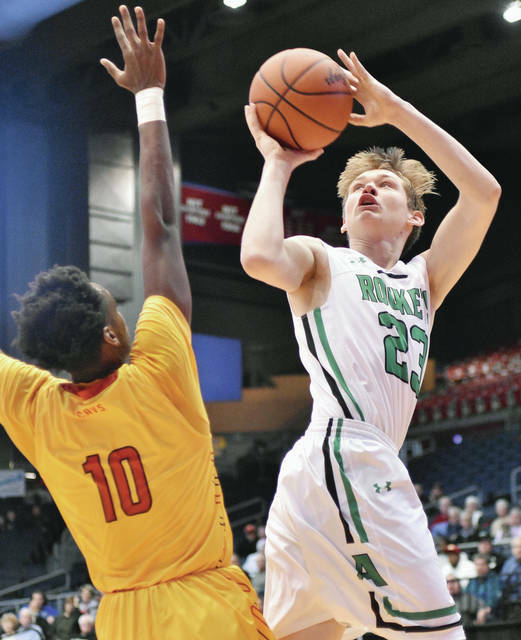 Anna’s Riley Huelskamp shoots as Purcell Marian’s Clarke Jefferson, left, and Alex Dotson, defend during a Division III district final at UD Arena on Tuesday. Anna’s Joel Cathcart shoots as Purcell Marian’s Alex Dotson defends during a Division III district final at UD Arena on Tuesday. Anna’s Wyatt Bensman shoots against Purcell Marian during a Division III district final at UD Arena on Tuesday. Anna’s Joel Cathcart shoots against Purcell Marian during a Division III district final at UD Arena on Tuesday. 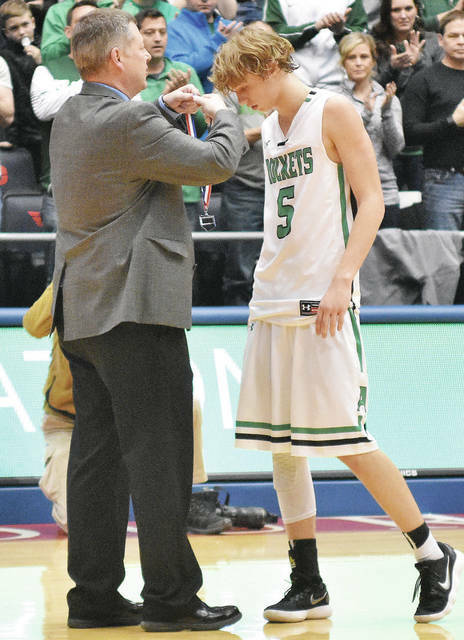 Anna’s Wyatt Bensman is awarded his runner-up medal at UD Arena on Tuesday. Bensman was named the SCAL player of the year this season. Anna’s Bart Bixler shoots as Purcell Marian’s Ace Taylor defends during a Division III district final at UD Arena on Tuesday. DAYTON — Purcell Marian brought a style of play Anna had come close to seeing this year only in a preseason scrimmage with Sidney and Springfield. 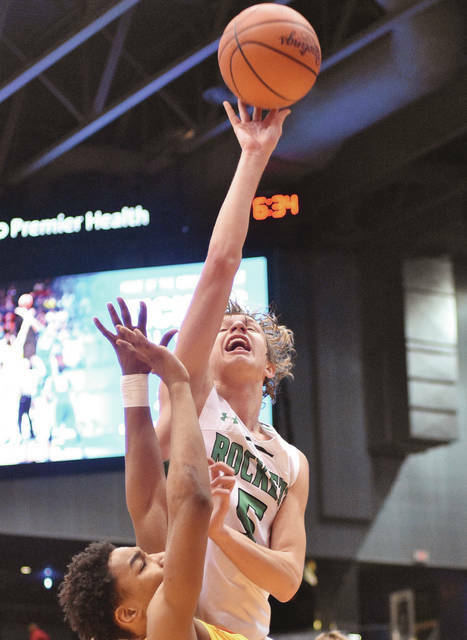 The Cavaliers moved the ball with up and down the court and in and around Anna defenders throughout a Division III district final on Tuesday. And though Anna was able to keep up for awhile at the free-throw line, they couldn’t keep up in the final 12 minutes. 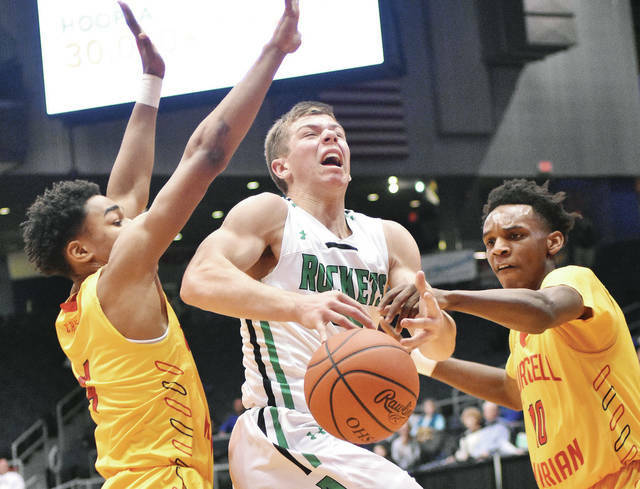 After the Rockets pulled within six points late in the third quarter, Purcell Marian scored the next seven points to spark a 78-65 win. Anna, which had won its eight previous games, finishes with a 21-5 overall record. 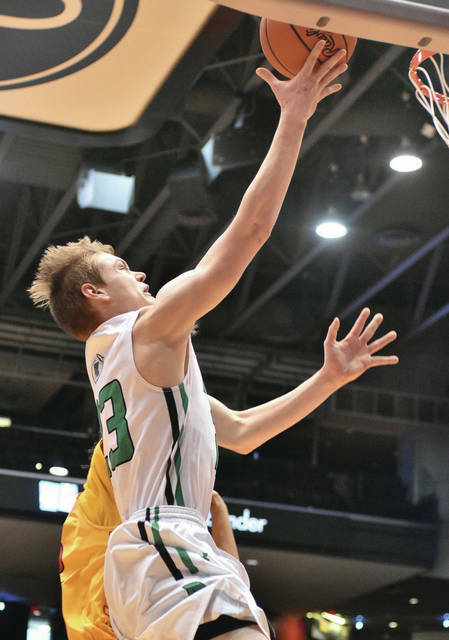 “It was like an AAU game out there,” Anna senior guard Wyatt Bensman said. “I feel like we just weren’t as well-prepared for that quickness and speed. Some of our guys hadn’t played that type of basketball. We’ve played a little bit, but nothing that quick. Anna scrimmaged Sidney and Springfield — which played in a one-point Div. I sectional final last Friday — in November. Anna coach Nate Barhorst said Springfield was the closest in terms of speed that Anna had seen. “It’s very hard to guard five quick guys like they are,” Barhorst said. “We thought if we packed it in and really helped off the drive, it would help us out tonight. It did from time to time, but they hit some key shots and had some guys dump down with passes that really got them going. Anna was able to take the defensive pressure as far as ball handling, but it was bothersome while shooting and fighting for offensive rebounds. The Rockets shot 17 for 43 (39.5 percent) from the field and had nine offensive rebounds while Purcell Marian (21-6) gathered 23 defensive rebounds. Anna was able to capitalize on 26 Purcell Marian fouls by making 28-of-38 free-throw attempts. The Cavaliers led by 11 points at halftime, but Anna scored the first four points of the third. Wyatt Bensman then hit a basket, two free throws, and a 3-pointer from the left wing in a minute and a half span to cap off a 14-9 run and pull Anna within 46-40 with 3:18 left in the third. Purcell Marian, though, responded with a 7-0 run and led by double digits for the rest of the game. The Cavaliers pushed their lead to 56-43 by the end of the third quarter and then started the first four minutes of the fourth on an 11-7 run. The game was an emotional triumph for the Cavaliers according to coach Scott Kerr. Purcell Marian student Greg Thompson was shot and killed last Friday night. Some team members were informed of the death during their sectional final game last Friday, and Kerr said the team didn’t practice on Saturday while dealing with the blow. Kerr said many team members were friends with Thompson, including junior AJ Garrett, who led the Cavaliers on Tuesday with 23 points and six rebounds. “It’s been a tough weekend, man,” Kerr said. “And not for me… but for these dudes to have to grow up through that and go through that. And the way they found out with Greg — AJ’s went to school with the kid since kindergarten, and he’s got people running up to the baseline telling him. We can’t even go to the locker room to talk about it. Bensman and Griffin Doseck each led Anna with 15 points while Joel Cathcart scored 12. Bart Bixler finished with nine. Doseck led the Rockets with seven rebounds while Bensman had five and a team-high three assists. Kerr said while many around the Purcell Marian community were unfamiliar with Anna, he knew the Rockets would be tough. Purcell Marian used a 9-4 early run to take an 11-5 lead. Bensman hit a basket with 2:46 left in the first to bring Anna within 13-8, but Bryan Warah hit a basket and free throw eight seconds later to put the Cavaliers up by eight. Purcell Marian led 18-10 at the end of the first quarter. Purcell Marian pushed its lead as high at 27-13 early in the second but quickly picked up seven fouls to go in the bonus. They then picked up their seventh foul with 3:22 left to put Anna in the double bonus. The Rockets took advantage. Bensman and Griffin Doseck combined to hit six consecutive foul shots to bring Anna within 29-22 with 2:53 left. AJ Garrett hit a bank-shot 3-pointer from several feet behind the right wing at the buzzer, though, to boost the Cavaliers’ halftime lead to 37-26. The Cavaliers shot 15 for 23 (65.2 percent) from the field while Anna shot 4 for 16. 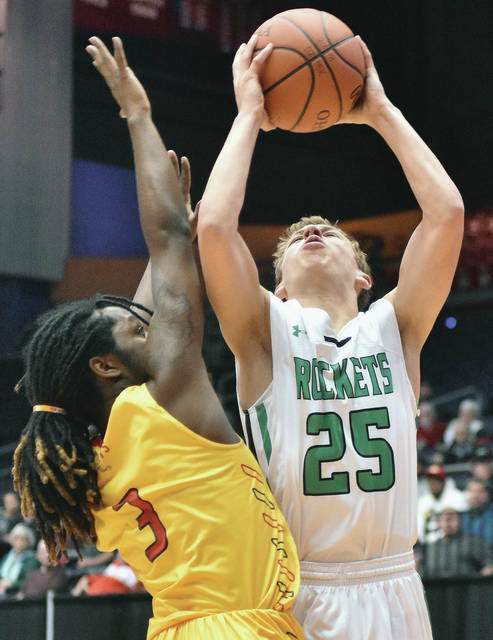 The Rockets, though, made 18-of-24 free-throw attempts while Purcell Marian made 5-of-6. Anna will lose five seniors to graduation: Bensman, Austin Fogt, Mason Platfoot, Cathcart and Drew Brodman. Bensman was the Shelby County Athletic League player of the year and averaged 16.5 points per game. Saturday’s game was Anna’s first district final appearance since the 2013-14 season. With a strong sophomore class with Doseck, Bixler and Riley Huelskamp and others set to return next year, Barhorst is confident the program can continue to have success. “With Bart, Riley and Griffin heading up the team next year, things are really looking up,” Barhorst said. “We’re going to have to get back after it to get to this point or beyond next year. We’ve got that potential, but we’re going to have to have a good offseason. This entry was tagged A.J. Garrett, Ace Taylor, Anna, Bart Bixler, basketball, boys basketball, Bryan Warah, Cavaliers, Clarke Jefferson, D3, district, district final, districts, Division 3, Division III, Griffin Doseck, high school, Javonta Lyons, Joel Cathcart, Nate Barhorst, playoff, Playoffs, Purcell, Purcell Marian, Riley Huelskamp, Rockets, Tournament, Wyatt Bensman. Bookmark the permalink.